If you ride a Sk8Kings Axe board -- you're part of the Axe Army. This long sleeve issue is just the thing to keep you warm and comfortable anytime! Made from Hanes or Gildan 100% cotton shirt stock featuring banded collar and sleeves. 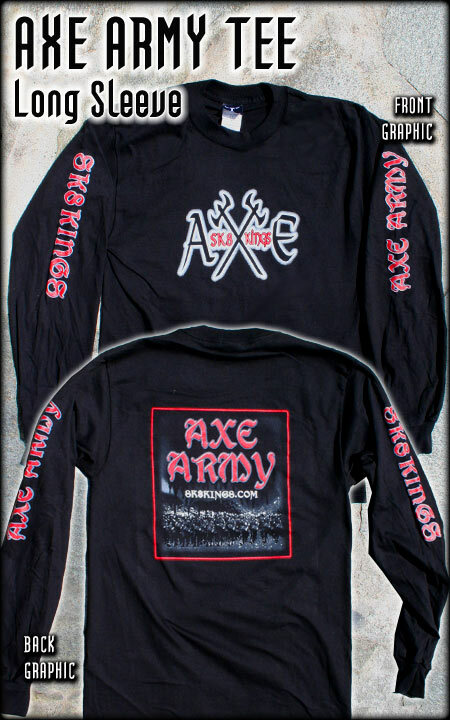 Our original AXE logo is front and center, the back is screened with our "AXE Army Racing Legions" graphic and each sleeve is printed as shown. Available in standard adult sizes S-XXL subject to current availability. Sport your SK8KINGS colors! AXE Army short sleeve and Axe Army girly shirts also available (see below)! Get yours at a DISCOUNT when you order with any Axe Series Deck or Complete -- See upgrade option on each deck or complete item and order at the same time to receive the special pricing.